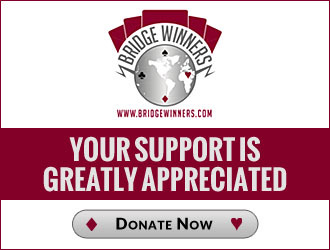 I am one of the founders of bridgewinners.com. More than half of my life has been spent travelling the world playing bridge. My wife Jenny and I have settled in Florida and have three children, Danielle, Brandon, and Ryan. We are both professional bridge players and met at the 2003 Bermuda Bowl in Monte Carlo. I love bridge.